EROS Part 1 by the E.T. The first part of EROS took an enormous amount of time; ranging from taking me months to days, mostly months for tracks to come together. Unwarranted Surveillance was pretty much written in a day! That just means I employed a lot of learned techniques quickly to the track and was able to create a fun experimental melody that works with the other heavy bass sounds in the track. Positron went through about 20 different iterations and took about 4 months; Positron and Stabilize my favorite tracks of the EROS, Part 1 album, but I’m extremely happy with how all of the tracks have turned out. This is an introduction to the concepts of the trilogy album and will evolve with Part 2, and 3. EROS is a three-part adventure. 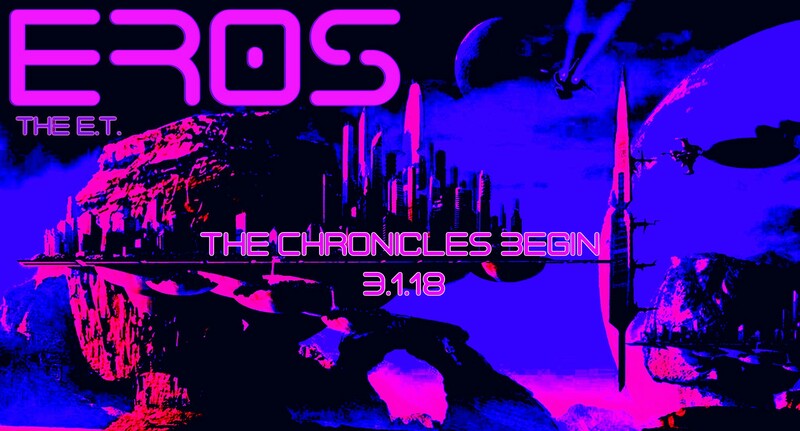 EROS is a concept album, a post-apocalyptic (you guessed it right!) space station that houses the criminals and fugitives of the intergalactic police, namely the Nemoans on the moon of Mars, EROS. The Nemoans are a race of giant toads that police the allied galaxies and are self-entitulated rulers of the galaxy, due to their military’s superiority. Toads are known to consume entire planets, some by themselves. Nemooah, the emperor has done this several times, though it is recognized as a legend by many rebels. EROS is the pinnacle of their demonic society and is influenced by my trip to Poland when I was 21. Part 1 contains 12 tracks about the technology and hero of the saga, J the alien. Part 2 will introduce Nemooah. Emperor Nemooah is one of the universes most grimy and slime coated giant toads from the boggy swamps of the gas giant, Xaxis. Xaxis was destroyed by humanity in 2119. Nemooah’s revenge was the end of humanities occupation of Earth. Nemooah now lives deep within the swamps of Earth, eating crocodiles and whales occasionally. The remainder of the people’s of Earth now live in EROS, an energy producing virtual reality space station build on Mars’ moon. The energy gathered from the human bodies continues to grow as the humans become more and more complacent with their virtual prison. Hope for the future of humanity and the universe is fading. There is only one being that is known to have escaped the Nemoan Federation since the beginning of time; a species, actually. the emperor has learned of their technology by the slim remains that he was able to find on Earth’s moon. He calls the race ‘novaborn’ as it appears that their technology requires the birthing of a new star, and not just any star, but one formed in the thickness of a new nebulae. This is the beginning of the story for our hero, ‘J’, who is the last of an extinct race of ultra advanced cybernetic organisms. They are called, the Novites, or the ones born of stars. J wanders galaxy in search for new energy sources that could help to provide a future for his extinct race and their technologies that once spanned the universe. He is the last one. “They are immeasurable… forces involved were too fast and powerful to even withstand basic readings… it destroyed our sensors. Specially, during the nebulae absorption process; we didn’t even begin to catalogue or record the birth… It has escaped through some kind of wormhole or portal at the end, my lord.” The undertoad looked down at his emperor’s corpulent feet with terror, he couldn’t stop his left eye from twitching. His veins felt like poison, his heart pounded. “Excellent, Emperor Nemooah, this is such excellent news!” Drysithe tried not to look at the dead toad at Nemooah’s feet. “Indeed, it is for you Drysithe; today will not be the day that I eat you. But perhaps tomorrow..” and with a smacking of his tongue against his toad lips, Nemooah launched himself outside, then tore into the softer ground with a massive launch into the heat of the blazing nearby star. He used his jetlike rocket-pack to disappear into orbit on the horizon-line; headed for the nearby moon and the Nemooan intergalactic space station that shadowed its orbit with massive spires and rings that swirled endlessly in magnetically enhanced patterns to create the massive energies needed to travel between galaxies. space-station’s rainbows of color struck Drysithe as he realized that he would love his wife and see his child this hallowed eve. Tears streamed down his face and nothing has ever seemed so beautiful as the station, radiating brightly against the dark oblivion of the beyond.